I am working on a horse currently with this problem. The summer of 2013 I was called by the owner-at the request of my veterianarian-to come and look at their horse. As he and other veterianarians, and their farrier had no idea what was wrong or how to help. I went and did my 3 Massages, which usually work out most problems-and he was better afterwards, but not as much as I was hoping for. We sent away for muscle testing and it came back for fungal infection, which was treated with herbs recommended to us. He was much better after that-once we stopped the herbs though, he went downhill again-in just a couple days! So we built the immune system and put him back on the herbs-we worked hard with cleansing his blood and building his immune system. He was finally coming around, so much that his owner-who is 83yrs ‘young’ started riding him again! He was running around the pasture like a 3 year old. He was back, and we were thrilled. He did have a history of founder and that could’ve been part of the problem, but the farrier said there was nothing that showed founder and xrays didn’t either. This is why I mention the founder…Spring of 2014, came time for vaccinations, the owner was very selective and only gave 2 that were recommended by her chiro/vet…west nile and tetanus. Those were all she gave him, the next morning-he was back to square one! He could barely MOVE! 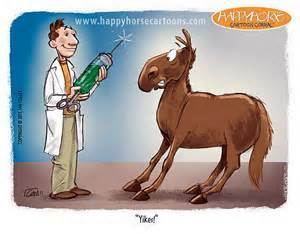 He couldn’t hardly walk, he was laying down-the vaccines trigger the laminitis! Once that happened, it created a snowball effect…laminitis, and abcesses in all the hoofs! We were all devastated by this, since it took so long to get him out of the fungal infection he had last year. We did do raindrop therapy, with some relief, just one day. And back again to no movement, laying down and soreness everywhere. We are working now on boosting the immune system, and cleansing him again, with colloidal gold, olive leaf extract and we’re going to add nux vomica and ledum to this protocol. I will keep this updated for those who are going thru the same thing.